Rural students, living in small villages, who enter university for the first time, need, in many cases, to make major personal adjustments to their new circumstances in a very short time. Most are overwhelmed by these requirements to the detriment of their study programme. In recognition of this need, the Fund instituted a one day workshop in December each year to instruct new university entrants in the disciplines and requirements needed to adapt to university life in the shortest time possible. They also learn to deal with unexpected problems and are cautioned against indulging in risky behaviour. 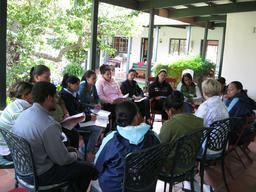 Workshops are held in a relaxed rural setting and are led by professionals in different fields. Topics covered include Registration; University structures; Fresher week; Student expectations; Bank accounts; Budgeting and Study loans; Setting targets and Positive thinking; Library skills; Study and Exam techniques; Time management; Social issues and much more. Students have a good opportunity to meet their future mentors during lunch and at tea breaks.